Coconut oil didn't always carry the best reputation. Sure, the coconut is pretty, and VERY popular with carton animals, but can something this fatty actually be healthy? It turns out that coconut oil fat is not your every day, run of the mill fat. To the contrary, coconut oil has “good” fat, benefiting us beyond our wildest dreams, say Dr. Oz. So coconut oil contains medium chain triglyceride fat. Contained in lauric acid, this fat boosts our “good” or HDL cholesterol while it stimulates the consumption of the “bad” or LDL cholesterol. Nice double whammy! There’s not a lot of science behind the coconut oil craze so far. There was one study in 2009 that followed women for 12 weeks, with half of the group taking a coconut oil supplement and half going without. After the 12 weeks the coconut oil half of the group had measurably less belly fat. This was based on only taking about 2 tablespoons of coconut oil a day. Other apparent benefits of coconut oil include improved thyroid function and better blood sugar control through stable insulin release. Proponents claim better endurance and higher energy throughout their day. 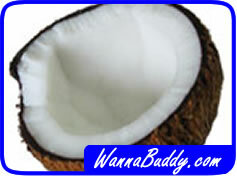 Coconut oil is also wonderful for our skin, when applied in a cream. Believers tout the anti-aging properties of coconut oil, which is great, too. So blend up a piña colada and get someone to rub a bit on your back!